A: Not certain where, when and exactly why people started forming the belief that higher-efficiency speakers automatically present better articulation, detail resolution and dynamics. This is not necessary true. As long as amplifiers are operated within their linearity window as they should be, there are no differences in musical details fed into the speaker in precise proportion, be the amplifier rated at five watts or one kilowatt. Different efficiency ratings only represent different power requirements to achieving matched SPL. The sound quality relies on the speaker design; it has nothing to do with efficiency. 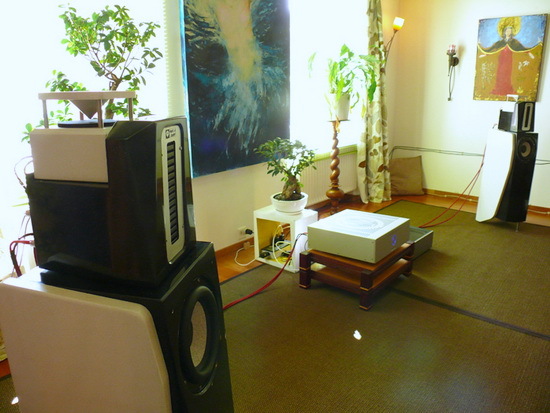 that he had made an parallel comparison to the 94dB high efficiency speakers with Mark & Daniel’s Fantasia-S (86dB) proven the lower efficiency speakers can still be better sound in most of aspects, at either low or high levels. Speaker efficiency is totally irrelevant to sound quality! Higher-efficiency speakers rely on higher magnetic field strength and more involved technology for the necessary light-weight cones which are directly proportionate to expense. Inexpensive speakers normally use cheaper parts with lesser technology which is probably where this wrong impression originated. Reputable speaker manufacture involves not only creating fundamental design concepts but many parameter trade-offs and production details beyond the audiophile’s ken including frequency response, harmonic distortion, crossover architecture, efficiency, manufacturability, expense and so forth. Any speaker system involves a four-step transduction from the electronic realm (the drive current from the amplifier) to mechanical vibrations, from mechanical vibrations to pressure waves and from pressure waves to room coupling. Any qualified designer can easily make a speaker by acquiring the necessary drivers and parts from catalogues, then putting them all together to meet those general specifications. Yet it is not automatically considered a good speaker. Any minor change to any one parameter within the four-part transduction process would significantly alter the outcome. These infinite possibilities are what makes designing speakers so much fun! It’s why M&D decided to do speakers not amplifiers. Now back to efficiency. There were two major reasons why we chose relatively low efficiency for our speakers. We wanted to balance the various trade-offs in favor of affordability. Three major factors apply to any ideal speaker system - efficiency, bass response and enclosure size. You can get any two in combination but never all three. M&D voted for small enclosures and deep bass response so efficiency was sacrificed. M&D could of course elevate efficiency to a certain degree without much technical difficulties. You’d just have to spend a lot more on more powerful magnets. We simply do not see the appeal to impact our primary concern for value and affordability when we want to share our products with the greatest number of music lovers around the globe. A good 100W per channel into 8-ohm high-current amplifier is quite sufficient to drive any M&D speakers; and the higher power is of course always better which is why so many amplifier existing in the first place.